People crouch to collect leftover vegetables in Athens. 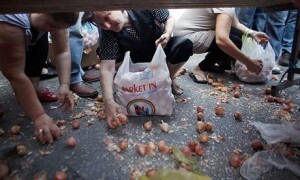 Photo: Bloomberg/Getty Images via Guardian. (7th in an occasional series on Designing for User Agency). After hearing plenty about it, I’m reading the interesting 2013 book Scarcity: Why Having Too Little Means So Much, by Sendhil Mullainathan and Eldar Shafir (behavioral economist, Harvard, and cognitive scientist, Princeton, respectively). I couldn’t help but notice that how I’m reading, and why I’m reading the book right now, are themselves an example of what the book talks about. First, in general, I have piles of books and articles I’m quite interested to read, along with many projects and tasks — I’m constantly aware of the scarcity of my time/attention, and puzzling over best methods to allocate scarce attention among them. Like the path of the righteous, this effort is beset on all sides by iniquities and the tyrannny of circumstance. the feeling of scarcity depends on both what is available and on our own tastes…We let preferences be what they are and focus instead on the logic and the consequences of scarcity: What happens to our minds when we feel we have too little, and how does that shape our choices and our behaviors?…. Scarcity, in every form, creates a similar mindset. The rest of the book studies that mindset, and might be summarized as follows: Scarcity, defined as perceived lack of any resource, tends to lower bandwidth (mental/decision-making capacity) and lead to tunneling (short-term distorted focus). This tends to create a scarcity trap, or long-term continuation of perceived and/or actual scarcity. The argument in Scarcity was visualized and extended in an interesting way by Christine Cavalier (@PurpleCar) in her book review, which includes the diagram below. She observes that while the book focuses on the case of scarcity trap, we might contrast that state with other attentional states that result from different combinations of the same factors. 1) “Management and Prevention”: a positive or functional alternative to scarcity trap, in which scarcity and tunneling exist, but also sufficient bandwidth to manage the situation. in this state, a person has the experience of scarcity, but also the bandwidth or decision-making ability to handle it, without falling into tunneling problems. the alternate scenario of bandwidth with tunneling but without scarcity. 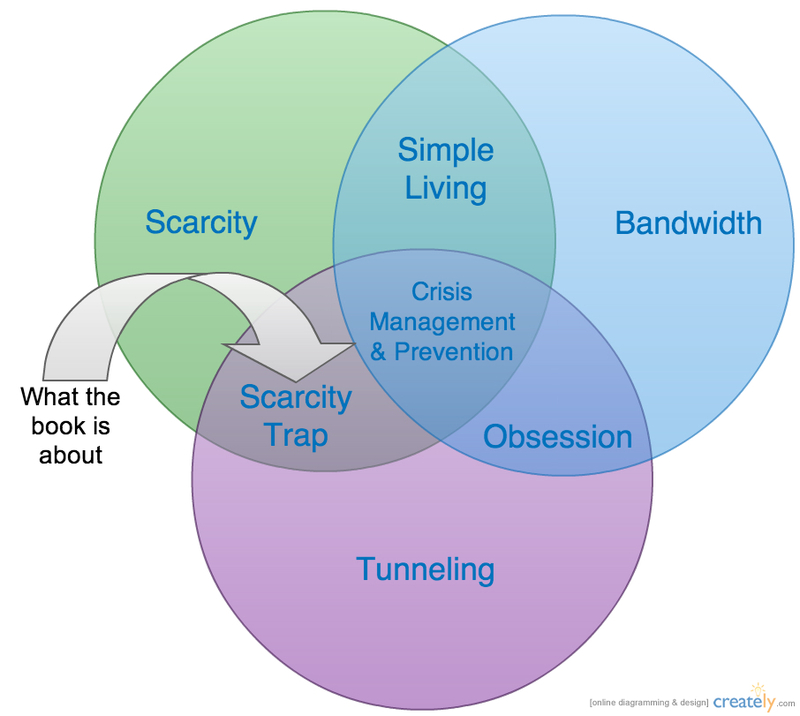 1) Scarcity doesn’t necessarily lead to scarcity trap, as the drift of the book might tend to suggest, but leads some people to healthy simplicity. What are the factors informing that? 2) The difference between positive “simple living” and (often) negative “obsession” is that scarcity is absent in the later case; so scarcity is a positive factor. Mullainathan and Shafir do discuss various cases of scarcity creating helpful prioritization, such as the scholar who finishes a paper well under time pressure, or Gersick’s research showing that business meetings are almost always more productive in their second half, when time shortage starts to be perceived. However the general drift of the book is to suggest that scarcity of all types tends to deform our ‘mindset.’ Viewed via the lens of Cavalier’s diagramming, on the other hand, we might we more inclined to ask if situations of waste/misallocation (eg obsession) might be addressed by introducing forms of deliberate scarcity. This provides, I think, a fruitful perspective on issues of media design today. The information environment, for many of us, is one of incredible and aggressive profusion, totally at odds with our highly scarce attention and executive functioning skills. Increasingly, the tools offered us to deal with this are opaque, centralized, commercial services such as Facebook’s core Timeline feature or new Paper app, or Google Now, generally based on business models of maximizing and/or monetizing our attention. How might we retain the bounty, openness and serendipity of our profuse media world, but also ourselves build “helpful scarcity” so we can experience it healthily? That is, designs and practices which tend, in Mullainathan and Shafir’s terms, to conserve and use well our bandwidth, while avoiding tunneling? “Digital Sabbath” or device switching: voluntarily or automatically restrict some affordance, such as all electronics, all screens, or Internet access, at specific times of day or week. Limiting or scheduling interaction, eg when you will check/reply to email, or answer phone calls, or be interruptible by all at work. “Measuring Plate” model: to counter the “infinite buffet table problem” of being enticed to forever gather more to look at online, design media tools to help you moderate intake up front. For example, ambient feedback on how much you already have queued up, what portion of it you’re actually getting to, and in what parts you’re finding most value. I’ve prototyped and proposed such approaches for use in reading environments such as Pocket, Instapaper, & Readability — which, though useful, may become for many users just another infinite pile. To even be inclined to try such approaches, we need to realize that not only do we still have media scarcity — of our attention and decision-making towards it — but also there are beneficial types of scarcity which we and our tools might consciously strive for. see also: The Guardian‘s review of Scarcity, by Tim Adams. What do you think? Comments are welcome below, or by Twitter or email: tmccormick at gmail.com.